ALL MINIMUM WAGE LAWS MUST BE BANNED OR THE USA CEASES TO EXIST. NEW ENTRY: 01 MAY 2016, 1403 HOURS. Saving the USA and western civilization is simple; just ban all minimum wags laws. Minimum wage laws fuels inflation and inflation fuels welfare states all to the detriment of long term human survival. The USA and western civilization can't be saved until the old tried and true norms and traditions are first restored, and no amount of money and good jobs alone will do that. Unless all minimum wages laws are banned to rein in liberalism nothing can save the USA. If your culture and morals are almost totally corrupted more wealth only acts as an enabler to create bigger problems. SIRMANS LOG: 01 MAY 2016, 1439 HOURS. Sometimes it seems like I'm the only one with the wisdom to see that the minimum wage law is what gives government almost total power over the private sector. 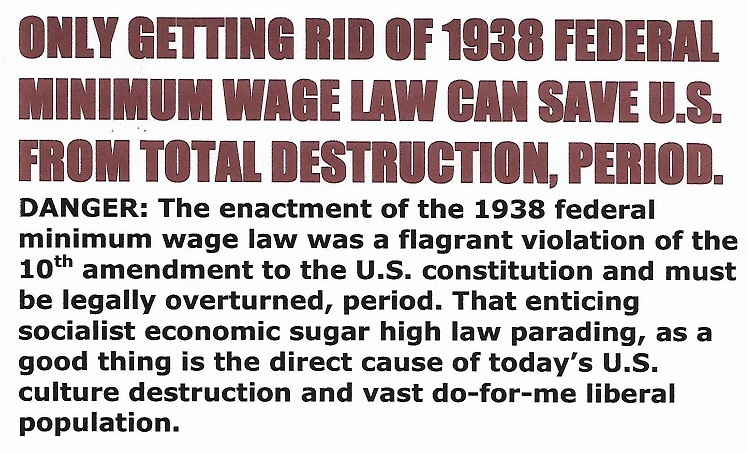 Before the insane arch-evil 1938 socialist minimum wage law was enacted each individual business decided what wages and prices to operate on and unrestricted competition purged out all inflation. The minimum wage law is what gave the liberals the power to create our welfare state beast back in 1938 by inflating our currency to no end. And ever since that day our culture, morals, and almost everything else has gone to hell in a hand basket. SIRMANS LOG: 29 APRIL 2016, 1234HOURS. All great civilizations falls from within, here in the USA I see it coming every day. The problem with the fallacy of masses of people jumping on a wishful thinking bandwagon is it’s like expecting a pot of gold at the end of a rainbow. The thing about a welfare state is it destroys discipline to the point that very few has a clue as to what raw bare boned survive is all about, I’m seen as a nut case but in survival terms nothing could be further from the truth. There never has and never will be a nation or society that survived without a stable nuclear and extended family system, period. I hate to say this and hope I’m wrong on this, but I feel western civilization with it’s welfare states no longer has the societal discipline, raw wisdom, or the will to survive a full scale economic collapse. Only banning all minimum wage laws can force the necessary societal discipline on us to prevent our total self-destruction. Liberals and liberalism with its creation of our welfare state is what got us in this dire fix. Its insane to think a liberal parading in conservatives clothing will save us, it ain't gonna happen, yet snake oil is being bought right now on a mass scale. First things first, nothing can save the USA unless we get back to the basics and reestablish a strong nuclear and extended family system again, banning all minimum wage laws will do just that. Today most people has forgotten or don’t know the basic foundation and building blocks necessary for human society to survive long term, I will give you a brief crude walk through. The number one foundation building block is the nuclear and extended family system and ours are in almost total ruins. Another foundation building block is to safeguard our small farmers and home gardeners for emergency backup bartering capacity in case our economy collapses, if the economy collapsed today almost no one would have anything to eat or to barter with. And above all the welfare state has blocked strong males from passing on proper norms, traditions, and morals that in the past safeguarded future generations. Only by banning all minimum wage laws can the necessary societal discipline be forced upon us to save us from ourselves. I am a lone writer with no connections or source of inside information. In private I'm sure the liberal news media and the Dem's are gloating and patting themselves on the back. Sure, they tolerate Mr. Trump now because they are so convinced that he will lose to Mrs. Clinton. However, once the general election begins the liberal news media will show no mercy in trying to destroying this great honorable businessman that truly means well. They will leave no stone un-turned looking for muck of every kind. You mark my word. Will they fail, no one knows, we'll see? SIRMANS LOG: 26 APRIL 2016, 2323 HOURS.